The polar regions can no longer be seen as untouched wilderness, although Antarctica is still less affected by human activity than anywhere else in the world. In the Arctic, the climate is already changing noticeably, and the annual mean temperature has been rising about twice as fast as in other regions in recent decades. Sea ice cover has been shrinking in the Barents Sea and the Arctic generally over the past 30 years. In 2012, a record level of ice melt was recorded in the Arctic. 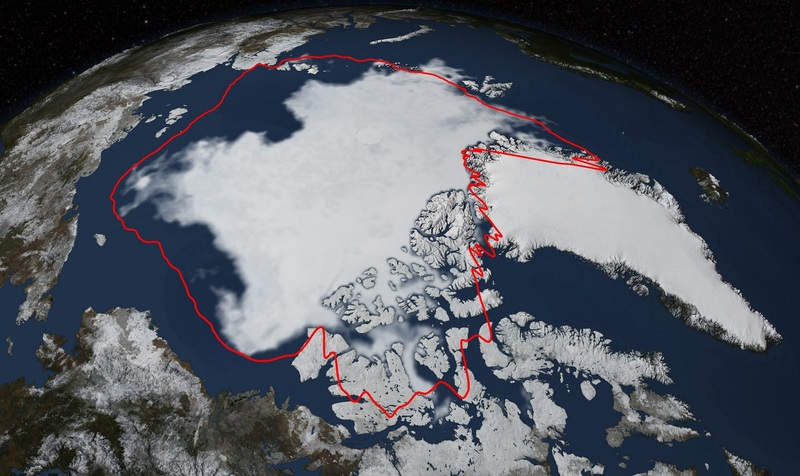 There had never been so little ice cover since satellite measurements started in 1979. The Greenland ice sheet and glaciers in Svalbard are melting, and the temperature of the permafrost is rising. Researchers are also warning of accelerating ocean acidification as a result of CO2 emissions. This satellite image from NASA (NASA/Goddard Scientific Visualization Studio) shows the extent of the sea ice on 12 September 2015. The area is the fourth smallest ever measured in the Arctic in september. The yellow line shows the average minimum extent over the last 30 years. The Arctic is also being affected by pollution. Although levels of several hazardous substances have declined, there are still alarmingly high concentrations in a number of species, including polar bears, ivory gulls, glaucous gulls and fulmars. The impacts of climate change are much less marked in the Antarctic, and pollution levels are considerably lower. The loss of sea ice in the Arctic poses a threat to many species. Harp seals and hooded seals will lose their habitat and polar bears their hunting grounds, and populations of fish, plankton and algae that are dependent on the ice edge are expected to decline steeply. Greenhouse gas emissions and pollution originating in distant parts of the world are having impacts in the polar regions. In addition, there is increasing human activity within these regions, and growing pressure to exploit oil, gas and coal reserves and biological resources. Tens of thousands of tourists visit Svalbard every year, the population of the islands is growing, and research activity is expanding. An ice-free Barents Sea will open up new areas of interest for fisheries, oil and gas activities and research. In the Antarctic, the fisheries, research and tourism are all expanding considerably. This may be harmful to the vulnerable environment of the Southern Ocean and more accessible land areas of Antarctica. Cuts in greenhouse gas emissions are needed to safeguard the polar environment. It is also important to protect large continuous areas of habitat and to regulate tourism, mineral exploitation and research activities. In the Arctic, stricter national and international legislation can help to reverse negative trends. Information on how to avoid damage to the vulnerable environment is also important. In the Antarctic, there is already a strict international regime that regulates potentially harmful activities. A number of the species in Svalbard have suffered from centuries of indiscriminate hunting and slaughtering. The result was dramatic reductions in populations of walrus, polar bear and Svalbard reindeer. Now, with conservation schemes in place for these large mammals, the populations are increasing again. The Governor of Svalbard is responsible for the day-to-day management of land species in the archipelago under the guidance of the Directorate for Nature Management. The responsibility for marine species lies with the fishing authorities. Special regulations for Svalbard have been laid down for the management of land species, including the Regulations concerning the management of wildlife (1996) and the Regulations concerning the management of arctic char and other freshwater organisms (1997). A new environment protection act for Svalbard entered into force in 2002. Good wildlife management requires detailed knowledge of each species range, population numbers, and biology. A number of the species in Svalbard have suffered from centuries of indiscriminate hunting and slaughtering. The result was dramatic reductions in populations of walrus, polar bear and Svalbard reindeer. Now, with conservation schemes in place for these large mammals, the populations are increasing again. In the case of reindeer, regular hunting is again possible. Changes in the environment, whether man-made or natural, influence population trends. In order to detect changes at an early stage we have to monitor animal populations, which is usually expensive and difficult in the Arctic. Not only are the natural habitats difficult to get to, the distances involved can be daunting and the climate is harsh. We therefore utilise satellite technology and aircraft in addition to the more traditional counting and monitoring methods. In recent years the results have improved our data on key species like polar bear, reindeer, walrus, and barnacle goose. But there are still many important details we do not understand. An environmental monitoring programme for Svalbard and Jan Mayen (MOSJ) has been developed to remedy this situation. The Arctic char is found throughout the Arctic region. In the Norwegian Arctic, i.e. Svalbard, Bjørnøya and Jan Mayen, it is the only freshwater fish. The char stocks are managed on the basis of regulations adopted in 1997. Fishing within the nature reserves has been prohibited since 1997, and anyone wishing to fish must first obtain a licence from the Governor’s office. There are two types of char, anadromous or sea-run char, and landlocked char that live permanently in fresh water. In Europe, natural stocks of anadromous char are only found in the three northernmost counties of Norway, on Iceland and on islands in the Barents Sea, especially Spitsbergen and Novaya Zemlya. Anadromous char have been found in 25 watercourses in Svalbard. The two types of char are descended from the same ancestors, but it is uncertain which factors determine the life history and strategy of the various populations. Obviously, for anadromous char to be present they must be able to migrate between salt water and fresh water. The most important factor in triggering a migratory life history appears to be the availability of food. Nutritionally, it is very advantageous for the fish to leave fresh water for the sea, where they can gain weight and grow faster. In certain watercourses, both landlocked and migratory char are found, but they may also live in separate watercourses. A certain amount of char is fished in Svalbard, mainly in fresh water. Most fish are caught in gill nets, and watercourses containing anadromous char are most attractive. Earlier overfishing with gill nets in some localities resulted in a steep decline in local stocks, because the large spawning fish were caught. Some char are also caught using gill nets in the sea, and there is some fishing with fishing rods, as well as ice fishing. The char stocks are now managed on the basis of regulations adopted in 1997. Fishing within the nature reserves has been prohibited since 1997, and anyone wishing to fish must first obtain a licence from the Governor’s office. To prevent excessive catches of large sexually mature char, the minimum mesh size for gill nets in watercourses containing char was increased to 52 mm in 1997. Before this, the minimum mesh size was 40 mm, but this appears to have resulted in overfishing of char measuring about 35-40 cm (400-1000 g). This resulted in a large proportion of the spawning population of landlocked char being removed from some watercourses in Svalbard. Today, a small number of Svalbard residents are issued with fishing licences each year. There is growing interest in ice fishing, but very few people use fishing rods. The Governor‘s office manages the fishery, and all fishermen are required to report their catches. Sound management of Arctic char in the Norwegian Arctic requires better knowledge of the populations in the various watercourses. We know too little about the species’ biology, both in fresh water and in the sea. Arctic char is an important reference species; in other words, studies carried out in Svalbard are very valuable for comparison with similar studies carried out elsewhere. Because of this, applications to farm char in Longyearbyen have been refused. Strict guidelines will be issued for fishing and biological studies of char on the archipelago. Indicators have been developed in order to monitor the state of the Arctic char in Svalbard, they will be published on the website MOSJ in 2016. The Arctic fox belongs to the dog family (Canidae), and is the only species in its genus. We do not know exactly how long there have been Arctic foxes in Svalbard, but they probably reached the islands some time during the last 10 000 years, after the ice retreated at the end of the last Ice Age. Arctic foxes are now found in the tundra of North America, Eurasia, Greenland, Iceland, Svalbard and in alpine regions of Scandinavia. There are two colour variants of the Arctic fox, blue and white. The winter coat of a blue fox varies from light blue-grey to dark brown, while the summer coat is chocolate-brown. The white coloured fox is only truly white in winter, and in summer its back and legs are dark brown and its belly and flanks yellowish-white in colour. The blue form is most often found along the coast and on smaller islands. Even though the Arctic fox has been totally protected in Norway since 1930, the situation for the mainland population is now critical. The species is classed as endangered in Norway's Red List. Arctic foxes are totally protected on Jan Mayen and Bjørnøya, but may still be trapped in the rest of Svalbard, except in protected areas. The population density in Svalbard is relatively high when compared to the alpine regions of Scandinavia. The Arctic fox was eradicated on Jan Mayen in the 1930s as a result of trapping. There are no small rodents in Svalbard, except in a limited area west of Longyearbyen. Food supplies for Arctic foxes appear to be more stable in the archipelago than in other areas where they are more dependent on small rodents. The population is therefore relatively stable. Arctic foxes will eat whatever is available, from carrion and refuse to prey they catch themselves. Food is far more available in the summer, when foxes eat mainly seabirds, geese and eggs, reindeer carcasses and ptarmigan. In winter, food is in much shorter supply, and the foxes survive on seal and reindeer carcasses, ptarmigan, food they have caught and refuse from the settlements. Arctic foxes are monogamous, and each pair establishes a territory, or home range, which they use for several years. In Svalbard, the size of a territory has been calculated to 35-50 km2. Foxes denning by the coast tend to have smaller territories than those denning in the valleys. However, most Arctic foxes in Svalbard are non-breeding animals. These are regularly observed on the drift ice several hundred kilometres from land, which suggests that they roam over large areas, probably between Greenland and western Siberia. Arctic foxes have a lower metabolic rate and lower body temperature in winter, which allows them to conserve energy. They also show a number of other adaptations that allow them to survive the harsh Arctic winter. The winter coat provides superb insulation, and they develop a thick layer of fat as a food reserve. The short snout and small rounded ears also help to conserve heat. In addition, Arctic foxes can lower their metabolic rate even further when food is in short supply, so that they use their energy reserves more slowly. This means that they can survive starvation for longer, and are more likely to have a chance of finding food again. Arctic foxes can spread diseases such as rabies and parasites to both people and other animals. The species is the main carrier of the rabies virus in the Arctic, and also the main host of a dangerous parasite, the tapeworm Echinococcus multilocularis . It is difficult to say how long rabies has been present in Svalbard, but the first documented outbreak in Arctic foxes was registered in spring 1980, when 12 animals were diagnosed with rabies. In the period 1981-1992, the virus was found in a total of six Arctic foxes. Trichinella sp., the nematode parasite that causes trichinosis when it penetrates the muscles of the host animal, was first found in foxes in Svalbard in 1983. The parasite does not appear to cause symptoms of trichinosis in Arctic foxes in Svalbard. The tapeworm Echinococcus multilocularis was first found in the eastern short-tailed vole in Svalbard in 1999. The Arctic fox is the main host for this parasite, and the vole is the intermediate host. Dogs can also function as the main host, and if people are infected, they can replace the vole in the parasite's life cycle, but this can cause serious disease. The parasite has been found in dog droppings in Longyearbyen and in fox droppings in areas where the voles occur. The Arctic fox has been an important quarry for trappers and hunters in Svalbard for many years. Although the species is no longer of much economic importance, recreational hunting is still a popular activity among permanent residents. In addition, foxes provide a valuable economic supplement for the few people who still live by hunting and trapping. According to the regulations relating to hunting and fishing in Svalbard, Arctic foxes may be taken outside the protected areas from 1 November to 15 March. Since 1997, anyone who traps foxes has been required to purchase a hunting licence from the Governor's office, and their catches are registered. The carcasses are collected for scientific studies by the Governor's office and the Norwegian Polar Institute. To manage Arctic foxes properly, we need to know more about the size of the population, the distribution of the species and migration. In addition, more research is needed into the effects of trapping, concentrations and effects of organic pollutants in foxes and the vulnerability of the species to various forms of environmental disturbance. We also need to learn more about its biology - its ecology, adaptations to its habitat and energy needs. The Norwegian Polar Institute is running projects in a number of these fields. More information is also needed on diseases and parasites, especially rabies and the tapeworm Echinococcus multilocularis.